No code yet because it's really rubbish and needs cleaned up. It would be great to have a way to output information to a log file. wanted to write a roguelike. I spent a while finding out what to do with the roguelike. Then it dawned on me I could use the Chthonic Codex setting, make the character a student in the University and give the players some pet goats. For the time being goats only attack enemies and get killed horribly. Add magic and that's pretty much what the game will be about. The game is gong to be mission-based, with your cranky professor giving a mission per quarter. Of course if the goats stay alive for a while, you get more goats. Goats do that. They also make convenient sacrifice victims and, of course, are great scapegoats. So, if you are about to die and you have a goat, the goat dies instead. Amongst the treasure you'll be able to find goats. Not sure if I'll manage selective breeding, or any sound effect (I'm going deaf and I'd rather spend time writing code instead of writing bad music, but if someone can help it would be fantastic). Pico lacks native stack and queue support. I'm unhappy about it, so i cried a bit and my friend GreyKnight came up with a small implementation of a deque (queue/stack combo). From preliminary tests it works fine. If you want to save tokens you can do away with defining push and enqueue and just use add() instead. 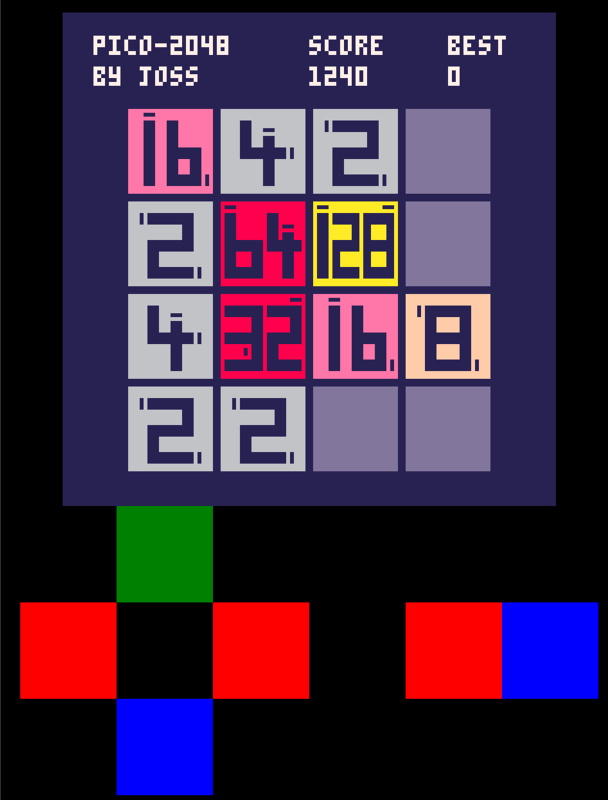 I'm kind of working on a couple of shameful hacks for Pico. The first one is a network stack. Since Hey @ lexaloffe is not answering my emails, I'm just keeping myself busy this way :p. I have a few ways I can try, including saving and reading from a cartridge that, in fact, is a named pipe. More on that later. It will create the dpad and the two buttons: Z on the left and X on the right. It also creates the buttons on a desktop browser. Try clicking on them. 7: tap on your new keys! For the time being it's not 100% reliable but it is perfectly adequate for turn-based games. The code is really garbage that should be better factored but hey whatever, it's a proof of concept. One known bug: pressing too long on a button selects it. I'll eventually fix it. I'm writing a roguelike! it's not even a game at this point, because all the gamey bits are missing (victory conditions, interesting decisions, etc). So you need stuff(monsters, magic, item, traps). But how do you put stuff in? For the time being I'm doing it when the room is created. The rooms can vary in size a whole lot by design, but I'm kind of worried about having the same amount of stuff in small and huge rooms. So before i start do delve into the pinzillacchere accretion pattern I wanted combat done, a level generator and monsters spawning. Combat is done! monsters can fight and die! 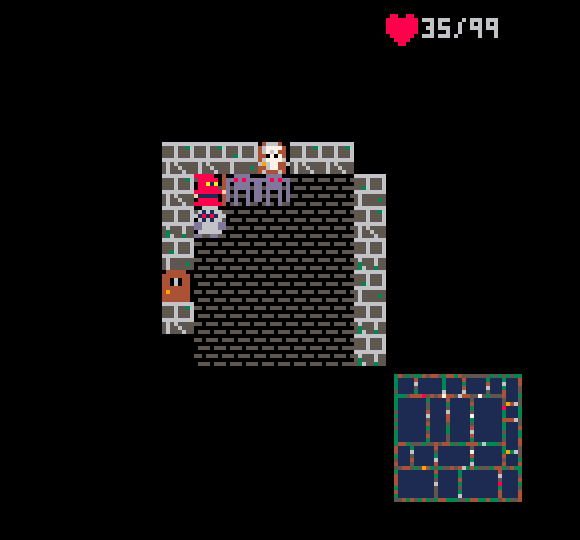 Small screenshot here with the wizard chased by an angry mob. I also added x-flip to the actor's sprite depending on their direction. Not much but helps a lot make sense of screenshots. I'm posting the implementation algorithm because I'm not sure if I'm doing things in a way that is blatantly wrong for Lua, or if there's a better way. I'm very new to Lua so, well, I'm kind of clueless about how to write good Lua software. I saw a few implementations around and was wondering what's the best choice for LOS in Lua, also considering that code points are a scarce resource and between them and heat maps I feel somewhat... constrained. So, yes, what's the best line-tracing implementation, given a metric of your choice? I ended up shadowcasting toward each of the border coords in a 11x11 bounding square, with the player in the middle. That's 42 rays. But then some walls that ought to be visible were not, so i cast 38 more rays to the 9x9 bounding box, and everything is ok.